Strong, versatile and long lasting, this popular shape can be used for many applications. Accu-Cut cutters are renowned for their superior cutting edge technology. Cutting edges have a hardness of 63-65 HRC for exceptional durability and are sharpened cut crisply at the very tip and along the entire length of the cutting edge. Unique joint design also ensures that the cutting edges stay in perfect alignment for superior performance. 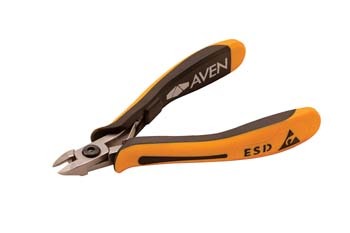 Grips are ESD Safe and ergonomically designed to exceptional comfort to increase operator productivity.